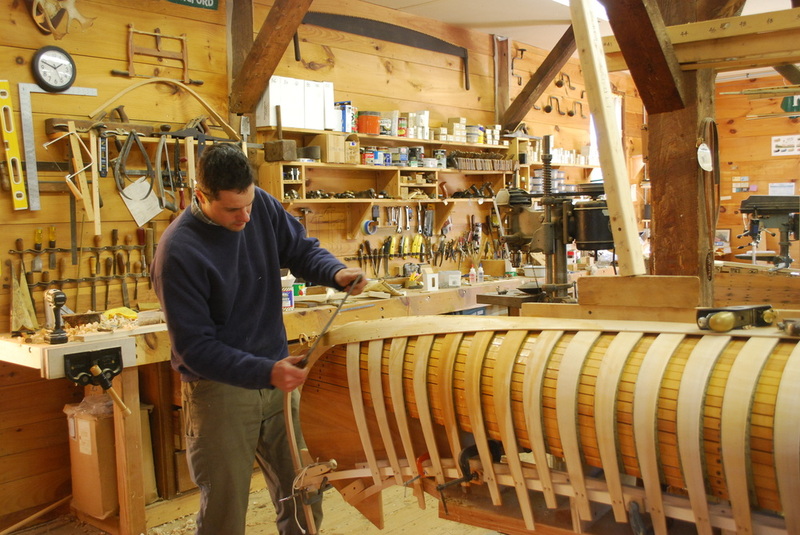 Traditionally built wood canvas canoe construction, wooden canoe and wooden boat restoration, Shelburne Massachusetts. Old Town, Penn Yann, Rushton, Morris, Robertson, Waltham, Brodbeck, Peterborough and more. Welcome to Salmon Falls Canoe. We are a wooden canoe shop that specializes in traditional construction of wood and canvas canoes, and restoration and repair of wooden canoes and boats. Our new canoes are built individually from scratch with meticulous craftsmanship. Our restorations bring beauty and function back to family heirlooms. Shop Talk > our blog of recent shop projects. For 16 years our approach to canoe building has been simple; the most important canoe or boat we will ever build or restore is yours. We use the best materials and take our time to do it right. We are just as proud of our workmanship as you will be of your canoe, and we hope it will be a heirloom in your family for 100 years! The Crew> a dynamic duo, keeping the craft alive. The shop facility for Salmon Falls Canoe is set up in an old post and beam barn that was renovated by us specifically for canoe building and restoration. We are fully equipped with separate rooms for construction, milling, finishing, and plenty of indoor storage. We are located in the rural town of Shelburne, Ma, just off of Route 2. Make an appointment > visit our shop.